The most effective resource for teaching computer application skills! 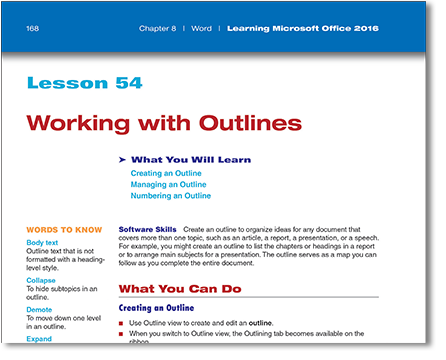 Learning Microsoft® Office 2016, Level 2 covers Word (the word processing tool), Excel (the spreadsheet tool), PowerPoint (the presentation tool), and Access (the database tool). Because Microsoft Office is an integrated suite, the components can all be used separately or together to create professional-looking documents and to manage data. 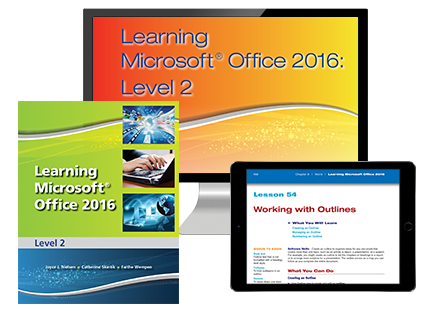 Chapters are comprised of short lessons designed for using Microsoft Office 2016 in real-life business settings. 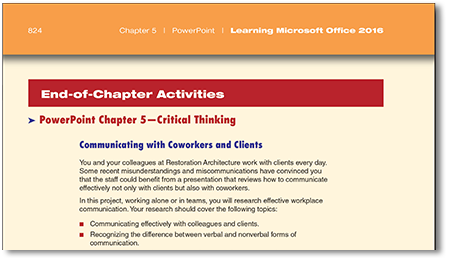 Each chapter opens with details of the skills, vocabulary, and key concepts that students should master after reading the chapter. 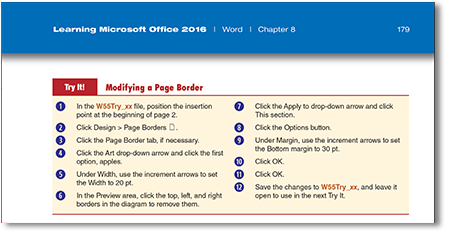 Short, hands-on activities give students the opportunity to practice the software features in a sample document. Topics include a variety of business, career, and college-readiness scenarios. Critical-thinking skills are required to complete the project.